In the lead-up to the Evad3rs jailbreak of iOS 7.0.x with the Evasi0n tool, many had begun to doubt whether Apple’s continued efforts to plug exploits had got the better of the jailbreaking community, and that the hackers had essentially hit a brick wall. Zoom forward one year, and following on from two jailbreaks for iOS 7, we now have our second for iOS 8 – this being just two months after the latest software first appeared back in late September. TiaG has, over the past few days, taken care of iOS 8.1.1 as well as the currently beta iOS 8.2, and while some jailbreakers have been a little hesitant given that it essentially emerged from the ether, one seasoned jailbreaker has declared it safe to be used. Whenever you go ahead and jailbreak, there’s a certain amount of calculated risk involved. Since you’re allowing a tool to access deeper system files, there’s always the heightened chance of security lapses, but while TiaG’s impromptu release has drawn a fair amount of skepticism, MuscleNerd has added a few encouraging sentiments on the brand-new jailbreak via his Twitter page. MuscleNerd goes on to note that the untether "is much more transparent than Pangu," which is always a good thing, so if you’ve held off jailbreaking your iOS 8.1.1 or iOS 8.2 beta device through fear of the unknown, then you can now comfortably go ahead and follow the tutorials outlined at the foot of this post. The "light device fingerprinting" that MuscleNerd mentions is not a major concern as such, and given the consensus of the wider jailbreaking world, TiaG is as smooth and seamless a jailbreak as we’ve had so far. So, kudos to the TiaG team for coming through with another untethered break so swiftly once more, and should we hear of anything noteworthy pertaining to TiaG or jailbreaking in general, we’ll have it covered right here. Is there an option to mute camera shutter sounds on japanese iPhones with this jailbreak? can I OTA update to 8.1.1??? if you plan on jailbreaking, you should always update via itunes. always. Use iTunes to update to 8.1.1 before jailbreaking. I’d like to know officially, WHY they released it now though? Question is 8.1.1 different enough that it will break Cydia apps/tweaks designed to work on 8.1.1 ? No, they all still work. 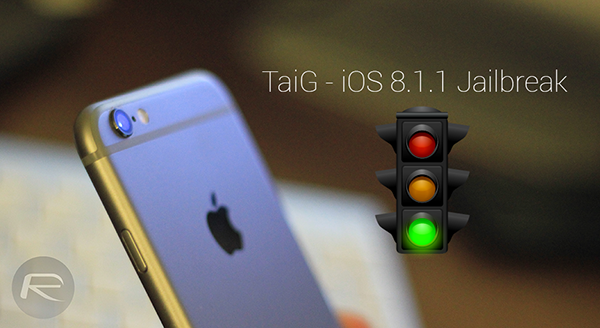 I guess this TaiG dident burn any exploits with iOS 8.1.1 so they did it because the could. Looks like most people are having good luck with it. I’m going to update and jailbreak tonight in my 6 Plus, iPhone 5 and 4S and see how it goes. Apple is still signing iOS 8.1 so for the immediate future, we can always go back to 8.1. Funny they are STILL signing 8.1 this long after an update however…makes one think, why??? This would be lovely: a tutorial on creating an “empty debuglog.cfg file next to the .exe file”. Or, a translation into stupid of what that means. It’s not illegal actually. Apple hates it though. It IS your device, Apple can’t stop you.